To Jab Or Not To Jab? ….The history of flu vaccination suggests other reasons to doubt claims that it dramatically reduces mortality. In 2004, for example, vaccine production fell behind, causing a 40 percent drop in immunization rates. Yet mortality did not rise. In addition, vaccine “mismatches” occurred in 1968 and 1997: in both years, the vaccine that had been produced in the summer protected against one set of viruses, but come winter, a different set was circulating. In effect, nobody was vaccinated. Yet death rates from all causes, including flu and the various illnesses it can exacerbate, did not budge. So why do people who are vaccinated get less sick? Skeptics say it’s because people who get the vaccine are healthier in the first place. In fact, it’s called the “healthy user effect” (catchy! 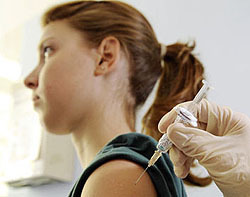 ), and a researcher named Lisa Jackson did a study a few years ago showing that people who got vaccinated during flu season were also much less likely to die even outside flu season. They really do seem to be a healthier group in the first place. So what to do? I’ve never gotten a flu vaccine before, and to the best of my knowledge I’ve never had the flu either. I was thinking of finally caving in this year and getting one, but now I’m not so sure. I don’t suppose it does any harm, but I don’t generally accept that as a good reason for doing anything else, so I’m not sure why I’d find it persuasive in the case of flu vaccines either. In any case, apparently there’s wide agreement even among skeptics that the vaccine is effective in children, and that immunizing healthcare workers and some others is a good idea in order to prevent the spread of flu. For the rest of us, I guess it depends on who you believe. Either way, though, Sumit Majumdar, a physician and researcher at the University of Alberta, offers this advice: “There’s no worse place to go than the hospital during flu season. But we don’t tell people this.” Now he has. UPDATE: After reading through the comments, I realize that my writing here was sloppy. Apologies. So just to be clear: Brownlee’s article questions whether the flu vaccine reduces flu deaths, not whether it works at all. If you want to reduce your chance of getting the flu and feeling crappy for a couple of weeks, get the shot. It might or might not have much effect on your risk of dying, but it does lower your risk of getting sick.